The Creative Outlier Air is the pair of true wireless earbuds to get if you’re unsure about the technology. Connectivity is reliable and sound quality, while not the clearest, is fun and resembles a more natural reproduction of sound. The Sennheiser Momentum True Wireless is what you buy if you have deep pockets and care about audio quality above all else. These might not be the best for most people, but if you want to block outside noise these are going to do better than any other pair. If you had told me two years ago that people would be genuinely interested in buying a pair of true wireless earbuds, I would’ve said, “Wait, why?” True wireless earbuds are easy to lose, don’t have great sound quality or special features, and drop audio far too often. While they’re still easy to lose, the tech inside has improved greatly. Don’t get me wrong: if you have a favorite pair of quality IEMs, you’re going to laugh at the thought of sound quality being good on true wireless earbuds. But if you’re looking to replace a pair of regular Bluetooth earbuds, you’re not going to be missing much in terms of sound. Especially if you switch out the included tips for a pair of Comply memory foam tips (a favorite of ours). This is still a really new category so don’t expect to be blown away by any of these options, but that’s what makes this list so exciting. We’ll be updating this list with new products that we feel deserve to be on it, and putting it through our usual testing so you know exactly what you’re getting. If these models are still too rich for your blood, check out our picks for best true wireless earbuds under $100. Editor’s note: this list was updated on April 22, 2019, to include the Creative Outlier Air. If you want to skip the experimental product phase and just want a pair of true wireless earbuds that won’t let you down check out the Creative Outlier Air. While these true wireless earbuds don’t offer the best sound or build quality, they do have the best battery life of any true wireless earbuds we’ve tested. That’s right, these ‘buds rock a standalone playback time of 7.78 hours, which laps some of the dinkier true wireless batteries. The Creative Outlier Air is compatible with both aptX and AAC high-quality Bluetooth codecs. Not only does this improve audio quality over the standard SBC codec, but it also reduces latency so you can watch videos lag-free. Other features include IPX5 water resistance and two additional charge cycles from the case. The Creative Outlier Air is notably bass-heavy, yet produces a realistic representation of three-dimensional space. Unfortunately, the earbuds don’t isolate well, making third-party ear tips a smart add-on. The Creative Outlier Air microphone is deficient when relaying very low voices, but effectively lessens external noise. Of course, at the end of the day, the Outlier Air are earbuds first. Audio quality may not be the best, but the exaggerated bass response will please most general consumers. Additionally, the reproduction of a natural-seeming, three-dimensional sound is both impressive and engaging. Unfortunately, there is a bit of auditory masking that occurs between the bass and midrange frequencies but if you’re using these while out and about, you’re unlikely to be bothered by it. Additionally, microphone quality exceeded our expectations. The integrated microphone mitigates environmental noise and promotes clear voice transmission. We’ve limited the chart depiction to the bounds of the human voice, and the above example is of Lily speaking with an industrial fan running in the background. Additionally, the earbuds relay call audio through both earpieces rather than one, making the Outlier Air a better choice for conference calls. When an old industry leader comes in with a high-end product, we pay attention and so should you. Sennheiser’s debut into the true wireless field offers extremely good sound quality, but it comes as a fairly steep price. You get what you pay for, however, as the Momentum True Wireless sound a lot better than their peers. Unfortunately, there aren’t much in the way of features here, and what you’re paying for is raw performance. If you want weather sealing, Qualcomm TrueWireless Radio Plus, memory foam tips, active noise canceling, or health tracking: you’ll have to look elsewhere. However, Sennheiser’s app allows you to control how your music sounds so you can EQ yourself. You can also add in a little bit of outside noise so you can hear your surroundings on the street, or you can just shut them out by hitting the toggle in the app. Fairly intuitive touch controls also give you the ability to control your music, answer/end calls, and adjust volume. If you take an earbud out, it automatically pauses your music. If your main priority is connection strength, then look no further than the Apple AirPods. Despite their faults (which we’ll get into), the AirPods rarely drop the audio signal, making for one of the least annoying experiences around. Apple achieves this with a special W1 chip that you can only find in their products. Connecting is a breeze if you’re on iOS (Android users have to go through Bluetooth settings), but the connection is solid regardless of the operating system of your source device. They come in a handy charging case that initiates the connection as soon as you pop them open. On top of that, it holds enough battery to juice up the AirPods four extra times, making the five-hour battery life last 20 hours in total before needing to be thrown back on a charger, pretty good for true wireless. They also have crazy good microphone quality for calls and a quick charge feature that gives you a solid three hours of listening time after only 15 minutes in the case. Now, that said, they’re not perfect. Playback controls are extremely limited, and they sound just a tiny bit better than the wired Earpods. So obviously they aren’t the pinnacle of sound science. Like the wired Earpods these are also made entirely of hard plastic, so the fit is hit or miss, meaning you won’t get the best seal possible without using some extra accessories. Still, if you want a long-lasting pair of ‘buds with the least amount of connection issues, these are the way to go. Sony is no stranger to audio and has been in the game since it released the Walkman. The company that made portable music easier has been making a strong push into portable music yet again. Though it’s rare to see any kind of cool features in something as small as true wireless earbuds, Sony managed to pack active noise cancelling technology into their WF-SP700N wireless ‘buds. In our testing, these were able to reduce outside noise to a significantly higher degree than all of the others products tested (about 19 dB). That’s important if you don’t want to be bothered by any outside noises while listening to your music, but if you prefer to be aware of your surroundings these also let you do that. As you can see from the graph the ANC here does a good job at blocking outside noise in the mids and lows, which is helpful because these are the notes that are hardest to hear when out in public due to auditory masking. The SP700N ‘buds also come with ambient sound mode so you can hear what the conductor is saying next time you ride public transportation. They also have an IPX4 rating so you don’t have to worry about sweat or rain damaging them and the charging case will give you about 9 hours of constant playback. That said, the earbuds themselves only managed to scrape about 2.5 hours of constant playback so don’t forget the charging case when you leave the house or you’ll be out of luck. JLab came in as a bit of a surprise here, but when you offer sub-$50 earbuds that can hang with the rest of the pack: bargain hunters will want them. While they’re not perfect, they hit a good note with their $49 price tag, and they don’t force you into making any major tradeoffs. Battery life is decent, but not amazing, same for the sound… and the fit. There are a couple other rough edges, like the fact that calls only come in through the right earbud—and that they’re bulky. However, the app the JLab JBuds Air comes with works surprisingly well, and you wouldn’t be able to tell that these are far cheaper than the rest of the models on this list. If you’re not ready to commit to true wireless earbuds, the JLab JBuds Air are a great first pair. The RHA TrueConnect retails for $169.95, operates on Bluetooth 5.0, and is IPX5-rated. When it comes to a category like headphones or speakers, it’s a challenge to make a list like this. Not only are there plenty of factors to think about (sound, features, price, etc. ), there are also tons of products to choose from. It’s a process, to say the least. Luckily, that isn’t the case with true wireless earbuds. This is a fairly new category of headphones that are only a few years old, so instead of having to consider every pair of headphones ever, we only have to worry about the ones from the last few years. Still, that results in a lot more back and forth then you might imagine. That’s why we began doing some objective testing for ourselves to make sure we had a leg to stand on when talking about important aspects of a product like isolation and battery life. We try to get as much hands-on time with products as we can before declaring it one of the “best.” Which means that most—if not all—of the products on this list have been put through our full review process. But what do we do when we haven’t spent time with a product? Lots and lots of research. We spend hours browsing through forums and discussions within the audio community. Even if we’ve already reviewed a product we usually do this anyway to get as much of a birds-eye view of the landscape as possible. Jabra Elite Sport: If you’re looking for true wireless earbuds meant for the gym, the Jabra Elite Sport is another worthy pair you should check out. On top of a good fit, they also have a built-in heart rate sensor to help you more accurately track your workouts. Check out the full review if you’re interested. Jaybird Run: Jaybird has been running the Bluetooth earbud game (pun intended) for a while, and their true wireless ‘buds are also worth checking out. They didn’t make this mainly because of a somewhat jittery connection, but if you can live with a little inconsistency the Jaybird Run aren’t a bad option. But if the connection drops every now and then don’t say we didn’t warn you. Full review. Sony WF-1000X: Sony has been on a tear recently, releasing plenty of products that dominate their respective categories (see MDR-1000X M2 or Sony XB40). The WF-1000X true wireless earbuds are another such option that seems to be getting plenty of fanfare and might be worth checking out, though battery life doesn’t seem to be too great. Bang & Olufsen E8 Wireless: This model was absolutely exceptional in features, battery life, and isolation (memory foam tips are a godsend). However, it had persistent connection issues with Windows 10 and Android devices. For the most expensive entrant in our competition here ($300), those problems were enough to sink them. Full review. Rowkin Ascent Charge+, Rowkin Ascent Micro: are both impressive units, narrowly missing this list. The Charge+ offers wireless charging, and both have a fairly neutral sound. However, they both have some peaky treble and user-reported comfort hangups. Your mileage may vary. Monoprice True Wireless: These IPX4 earbuds directly compete with the JLab JBuds Air. The included case charges via micro USB, and the earbuds sport a sleek design. Unfortunately, connectivity issues prevail and result in an aggravating listening experience. RHA TrueConnect: Listeners who are looking for an AirPods alternative that fits better and boasts a more sophisticated design are sure to be happy with these IPX5 earbuds that operate via Bluetooth 5.0. Master & Dynamic MW07: If you’re not concerned with a tight budget and want something that oozes quality and attention to detail, these aptX-supported earbuds should do the trick. Jabra Elite 65t: If battery life and durability are your top two priorities, this former best pick is for you. 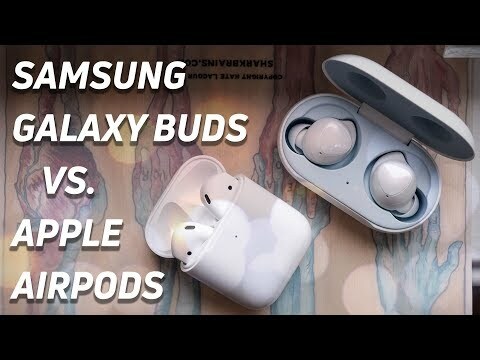 Samsung Galaxy Buds: While these true wireless earbuds are optimized for the Samsung Galaxy S10 line, as proven by the proprietary scalable codec, they work effectively with iOS devices too. A number of true wireless earbuds are about to hit the market with a new smartphone refresh, so be sure to check back for reviews and analysis of models. If you’re worried about connection strength, you’re not in the wrong. That’s a valid complaint about a lot of true wireless earbuds and even regular Bluetooth ones. There are a few ways that the companies have handled this ranging from tweaking Bluetooth to implementing completely new hardware. All true wireless headphones work via Bluetooth. The ‘buds pair to each other, and then one of them also connects to the source device. Audio data is pushed to that main earbud and then sent to the second earbud, which naturally results in a split-second delay between the audio. Manufacturers account for this delay and calculate it into the playback so that the two earbuds play simultaneously, and you don’t notice any disparity. Of course, you will probably notice the delay if you’re watching videos, as the sound won’t quite match up to what the person is saying. But if you’re listening to podcasts or music, you won’t be able to tell. Some manufacturers rely on this process alone, which means a somewhat finicky audio connection. However, the upside is they can keep the cost low because they don’t need any special parts. The Apple AirPods still look ridiculous, but people wear them for some reason. Then you have something like the Apple AirPods, which handle the whole true wireless issue a little differently. Apple created an entirely new chip dubbed the W1 or (H1 in the newer Airpods) which is designed to work alongside the regular Bluetooth chip. This dedicated chip helps make the pairing process smoother (if you’re on iOS) and establishes a stronger connection between the earbuds, resulting in significantly fewer skips. Of course, the downside to this is that because it’s a chip that Apple makes, it’s only available (as of right now) on Apple-made headphones, like Beats products and the AirPods. Though it would be nice to see what companies like Bose and Sennheiser can do with this chip, Apple hasn’t shown any interest in selling or licensing this chip. This is the part where we start showing our work. When it comes to headphones getting a proper seal is one of the best ways to make your music sound better. Some earbuds, like the Sony ones we mentioned above, have active noise cancelling which uses tiny microphones to help cancel outside noise. But most options don’t have this nifty feature. Instead, they rely purely on passive isolation or blocking sound just by physically being in your ear. To see which ones were best at blocking outside noise we put them all to the test and came up with this chart. You can learn the basics in this explainer, but all you need to know is we did the hard work for you. You can click here to learn more about what kind of ear tips might be best for you. Then there’s frequency response. You can learn more about what frequency response is and how it affects the way you hear your music by clicking here, but these should give you a basic understanding of how each product is going to emphasize certain notes. The note emphasis is a little less even than we expected, but it’s not bad, per se. Sol Republic’s Amps Air give us a more traditional consumer response. It may have a few tasteful alterations, but this frequency response is the best of all tested. It’s also the easiest to equalize. Like most of the models here, the BE Free8 is bass-heavy. However, underemphasized highs and mids might not be your cup of tea. The Jabra Elite 65t lack bass, but you’ll still be able to hear it just fine. The Earin M-2 is quite bass-heavy compared to other notes, but you may elect to turn them down. Apple does a good job at targeting a consumer response, but that bass will end up getting drowned out by literally anything going on around you. Easily the strangest note emphasis tested, the B&O Beoplay E8 emphasizes mids and highs. Though Bass notes are fine, using the foam tips will help them shine more. Battery life isn’t great. Deal with it. It’s good to know which pair will last you the longest especially if you have a long commute. That’s why we started testing every pair we could get our hands on for ourselves. The table below shows most of the true wireless earbuds on this list and even some that didn’t make it. As always, this is a work in progress so you can be sure we’ll be updating this table as we get more products in. As far as why battery life is so short on all true wireless earbuds, you don’t have to dig too deep into it to get the reason why. Truly wireless earbuds are simply too small. Batteries still rely on physics, and it’s hard to stuff a battery into something so tiny, which is why they all come with cases that will charge up your headphones when they’re not in use. This solution actually works really well, since most true wireless earbuds are easy to lose. When you’re not listening to music having a handy case to store them makes sense. For that reason having a charging case means that you’ll rarely take out your headphones to listen to music and find that they’re dead. They’ll always be fully charged, assuming you didn’t forget to charge the case itself. Unless you have a particularly crappy commute, two to three hours of constant playback, you should be fine. After all, once you get to wherever you’re going, you can throw them back in the case. Now if you’re a frequent flyer and are looking for a pair of headphones with a battery life that will last: you might be better off skipping the true wireless options and opting for a pair of active noise-cancelling ones instead. Luckily, we gave that category the same treatment, and have a best list ready and waiting for you. LDAC 330 underperformed compared to aptX and aptX HD. As with any nascent product category, early adopters will need to know a bit more about the tech that defines it. Namely, you need to know what to look for when figuring out if a product is going to be good or not. 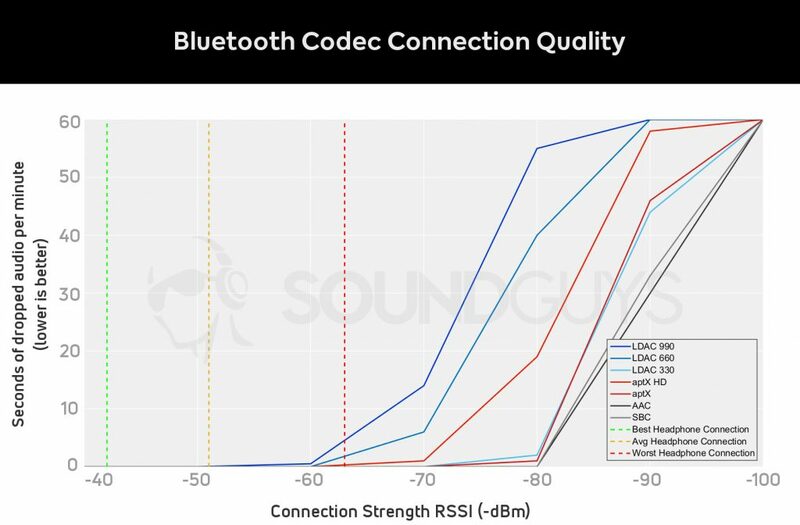 With Bluetooth audio, that means figuring out what Bluetooth codecs both your phone and your earbuds support. ... you should always buy headphones with the best codec available: even if your phone doesn't support it right away, sometimes a software update, or getting a new phone will unlock this capability for you later down the road. As per our investigative testing, it LDAC isn’t necessarily hi-res; in fact. What’s more, AAC is bunk when used on Android devices and should really only be used when listening via iPhone. If your Android phone automatically streams over AAC, you can always force developer settings to mandate SBC streaming instead. The long in the short of it is that Android users should stick to aptX. Related: Why is true wireless connectivity so bad? By using a dummy head, audio engineers are able to test out how audio products will perform for most people — and so do we. Specifically, we tested frequency response, isolation, and battery life to keep things simple. You can read more about it here if you want to know more about the specifics. For each product, we played several sine sweeps through the earphones and logged the frequency response once we arrived at a repeatable result that demonstrated the hallmarks of a good seal. To test the battery, we use pink noise and a real-time analyzer to find the setting needed to output 75dB(SPL) over the products, and we play music on an infinite loop. This means every reading can be directly compared to each other. To test isolation, we took a sample of pink noise at 90dB SPL at one meter, once with the headphones off, and another with the headphones on. We then subtracted one curve from the other. While these three tests are simple, they cover the biggest areas of concern with true wireless earbuds. Keep in mind that your battery life will vary if you tend to crank the volume. Additionally, you could squeak out better isolation performance if you use third-party tips. First and foremost, this is each of our day jobs. We get paid to listen to as many products as we can and do hours and hours of research ’round the clock. Yes, it’s as awesome as it sounds, and yes, we love it. But more importantly: this means that our opinions on products aren’t swayed by the companies that make them—because our livelihood doesn’t depend on a positive review. If we don’t like something, we don’t sugarcoat it. So if it made a best list, we must’ve really liked it. Especially if it’s Bluetooth because we all know how much Chris hates Bluetooth. In addition to that, we each have several years of reviewing consumer audio products under our belts. Having kept a finger on the pulse of the audio market for several years allows us to be able to figure out what’s good, and what’s best avoided. I’ve reviewed tons of headphones (both wired and wireless) over the course of almost three years, so I’ve heard the best and worst of what the category has to offer. These truly wireless earbuds are just another product category that we’ve been keeping an eye on. The Anker Zolo Liberty connectivity is dubious at best. Then there’s Lily who has worked for the radio station and racked up countless hours with studio-level microphones, headphones, speakers and recording software. All the while, deepening her understanding of the technical side of audio. Prior to that, her audio journey began in 2010 with YouTube reviews. Like anybody, her curiosity guided learning beyond work. She continued to self-produce YouTube videos, reviewing headphones until she brought her knowledge to our small but passionate team.